While there are very few rules of thumb that apply to all situations, it’s fairly well accepted that the more refined sugar someone eats, the poorer their health. But is this the full picture? Many common sweeteners are included in foods today – especially when you eat out or buy packaged foods. Do you know whether you sushi has sugar added to the rice? Just as no two pieces of steak have the same nutritional value, no two sugars are the same. Unpasteurised honey has very different properties to honey from your neighbour’s bee hive just as stevia from a packet can sometimes be very different from the stevia growing in your garden. In this article, we aim to simply sugar choice. We’ve broken down some of the most common sweeteners found in our food today into harmful, acceptable and even helpful when it comes to managing your better health. 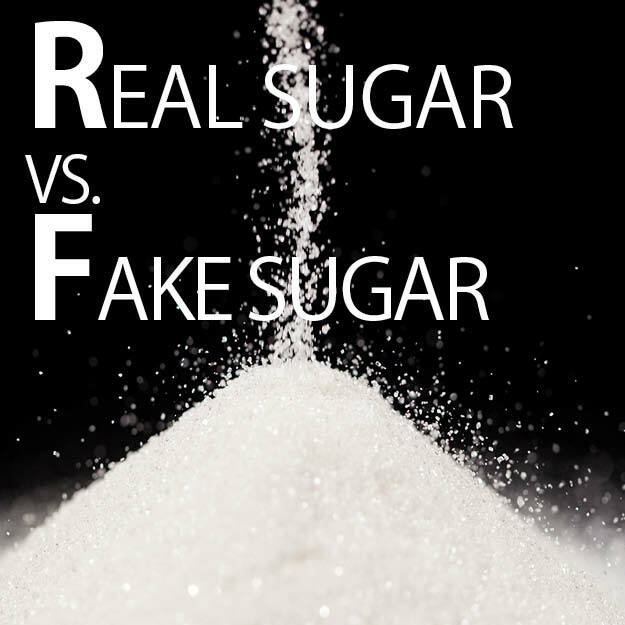 We all know that refined sugar is a highly processed food and that it is linked with immune dysregulation, heart disease, metabolic disorders, cancer, hormone and mood disorders. Even brown sugar and raw organic sugar from sugar beets or sugar cane can cause problems. In order to produce the crystallised sugar, the molasses is removed (and in the case of brown sugar, the molasses is added after the refining process). Without the digestive co-factors present in whole sugars, the body is left vulnerable to the glycaemic load spike. This leads to higher levels of hsCRP, which is a marker of inflammation and inflammation promotes disease. HFCS can be found in many processed foods. It’s made from corn, is inexpensive and shelf-stable. While corn in its wholefood form has some beneficial properties, in this extracted form, studies have shown that it becomes toxic and promotes disease. We weren’t going to leave you feeling like there is no sweet food you can eat without feeling you’ve made a bad health choice. Choosing sweet foods is part of a healthy balanced attitude and lifestyle. After all, enjoyment is one of the sweetest parts of being alive and sweet flavours are part of this experience. Sweet flavours are also pacifying for an anxious mind and high strung temperament. Unpasteurised honey is a whole food and it gets a big thumbs up from us here at EHMP – especially our local honey which contains pollen, probiotics, beneficial enzymes and other ingredients that help our immune systems cope with our local environment. Applying honey to certain skin conditions can be beneficial. It can also reduce allergies and chronic sinusitis. While it contains glucose and fructose when ingested, the body recognises it as a beneficial combination of nutrients and so it remains nourishing and soothing rather than raising inflammation and sending an alarm through our system like refined sugar would. Like honey, maple is a wholefood and completely recognised by the body as a friend rather than an enemy. If only this sweet sap was abundant in Australia as it is in Canada! Maple is packed full of precious antioxidants and beneficial phytonutrients that better help you to manage inflammation and balance in the body. Fruit is a wonderful part of a balanced diet and great way to add colours, textures and beneficial fibres to your diet. Think about the way pomegranate seeds sprinkled onto rice or mixed through a vibrant green salad bring the dish to life. Including a piece of papaya, pineapple or apple in your diet helps boost your digestion because the natural digestive enzymes in the flesh help you better break down your food. It’s also packed full of beneficial fibres, antioxidants and health promoting phytonutrients. However, it’s no surprise that the main sugar in fruit is fructose! We are seeing much more fructose intolerance linked with dysbiosis (digestive health problem when you have too much ‘bad’ bacteria and not enough ‘good’ bacteria). If this is you, keep fruit to a minimum (1 handful of lower fructose fruit per day) until you improve the microbial diversity in your gut. Try growing the stevia rebaudiana plant in your garden. The South Americans have grown this plant for generations and it’s often been used as a medicine. These days, we can also buy stevia in its calorie-free packaged form. Most studies conclude that stevia extract is non-cancer causing and, while it has been used as a form of birth control in South America, there are several studies that conclude that the extract does not cause the infertility. As with all processed foods, consume them in moderation. Our rule of thumb? Local unpasteurised honey and maple syrup are our favourites. Packed full of phytonutrients, antioxidants, probiotics, beneficial enzymes and deliciousness. As always, whole, pure and untreated is a wise choice when you’re cooking for yourself and your loved ones. When you eat out, there will be hidden sugars in many foods including sweet potato fries, mayonnaise, steak sauces, bread wraps and salad dressings. Given that balance and enjoyment are a crucial part of a healthy lifestyle we recommend you simply enjoy! Each person metabolises sugar differently. Please talk to your doctor about your unique constitution and health. Dr Romano is our go-to team member when it comes to sugar alternatives.